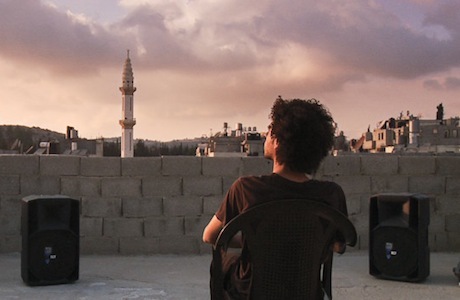 My Love Awaits Me by the Sea (Mais Darwazah's introspective, filmed essay, of sorts) is, in essence, an experimental documentary that's as much about identity as perspective and political awareness within Palestinian territory. Darwazah (a secondary generation Palestinian living in Jordan) decided to document her trip to her parents' homeland, using the writings of Hasan Hourani, a painter and poet that drowned trying to save his cousin. Intermittently, poetic epithets and flowery purple prose breaks up her handheld documentary pursuit, as do verbalized diary entries to the titular "love," Hourani, who awaits her by the seafront of Jaffa, according to the wistful voiceover. Amidst Darwazah's exploration of the self, trying to interpret her connection to this territory and conflict, she interviews various locals about the state of Zionism and martyrdom, capturing an abundance of inflamed invectives and impassioned thoughts regarding third-party motivations. These interviews are exceedingly candid, framed with a handheld camera and often interrupted by Darwazah, either encouraging controversial opinions or bringing the subject back to herself, giving a very personal, almost stolen and potentially incendiary feeling to these fleeting discussions. Though elderly women boasting about the fallen martyrs shown in posters on the streets and in shops are to be expected, much as youthful rage about Israeli soldiers articulated in a posturing game of collective male one-upmanship is self-explanatory, some of the more personal, restrained discussions prove the most shocking. A married couple raised elsewhere note that Palestinian territory is the only place they feel accepted, casually commenting that Israelis already know that they've lost deep down, since Zionism is over. That presumptive statements and idealist projections exist in such extreme political topics isn't surprising, but the calm body language and tone associated with this commentary — something that will have very different meanings and intonations to different audiences — have a chilling, quietly threatening sensibility that suggests Darwazah might be imperilled should she disagree. She, having a trusting, open demeanour, doesn't perceive this, or at least doesn't verbalize it, when she steps back to recite love letters to a deceased author. But there's something vaguely unsettling about the frazzled, subtly aggressive camaraderie present within these candid, oft-inarticulate and unplanned moments. It's here, beyond the rather broad assertions about reclaiming one's identity and coming to terms with the unexplored self by looking externally, that My Love finds its lasting power. Though the oblique structure of this filmed, politically conscious blog is what distinguishes it from the many documentaries about the Israel-Palestine conflict, it's also the aspect that doesn't quite work, coming off as more immature and indulgent than inspiring.